Deal with legal and tax issues. Avoid the most common mistakes. Each of the books in the Crash Course for Entrepreneurs series offers a high-level overview of the critical things you need to know and do if you want to survive and thrive in our super-competitive world. Of course, there’s much more to learn about each topic, but what you’ll read here will give you the framework for learning the rest. Between them, Marc A. 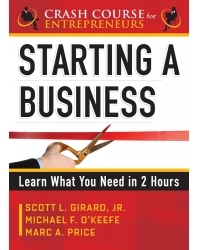 Price, Michael F. O’Keefe, and Scott L. Girard, Jr. have successfully started 17 companies in a wide variety of fields. Scott was formerly executive vice president of Pinpoint Holdings Group, Inc. Mike founded O’Keefe Motor Sports in 2004 and grew it into the largest database of aftermarket automotive components in the world. Marc has launched seven companies of his own and collaborated with the Federal government, U.S. military, and major nonprofits and corporations.